"But doctor, how come I'm having severe neck pain and my left arm and upper chest feel numb? "...That question of mine was answered by a bottle of pain killer and muscle relaxant that 2 days later didn't help. Back to ER I went. It was the same doctor, who was looking at me like I wasn't supposed to be there. But he felt the tenderness on the back of my neck and he just listened to my complaint of neck pain [I was probably figuratively a "neck pain" for him because I wouldn't settle to his diagnosis that nothing was wrong." This time, he ordered an x-ray. When the result was read by a radiologist and by him, he started interrogating me as if he was an FBI agent. Doctor: "Are you a nurse?" Doctor: "Do you remember lifting someone lately?" Me: [after a few minutes of deep musing..], "Come to think of it, I did help a nursing assistant that night prior to me complaining of pain, turned a patient to her side. The nursing assistant hurt her back immediately while I felt some pressure on my neck but I didn't think of anything. Why are you asking me these questions?" Doctor: "I'm sorry, the x-ray showed a little bit of herniation between C3-C4 area [cervical spine]. That's why you're having pain." The year was 1997. I had been working in an Orthopedic setting for 10 years at that time. I loved taking care of my patients and being involved with their healing process. It was great to see them up and walking again after 2 or 3 days after their total hip, total knee or other Orthopedic surgical procedures. If I felt for my patients having a lot of pain then, the more compassion I had after my own injury. The compassion I had shown, I never got from the hospital's insurance company nor the doctors who treated me. Because despite the pain I was feeling, if there was no test or x-rays that will prove the source, it was hard to defend my case and sometimes, I felt like they looked at me as if I was lying. I was a "born-again" Christian then when it happened but let's say I wasn't as mature as I am now. By God's grace He sustained me. Looking back, He was the One Who held my hand and believed in me. He was the only One Who knew the pain I was having. Yet, I chose to be positive despite those trials. Now that I think about it, did I choose it or God had given me that heart to do so? Either way, I know and I will always know the truth that He does help us as we go through trials. It's a long story of struggle and confusion as I started my treatment. But God is not a God of confusion. After almost 3 years of on and off pain, [I still have it at times but not as severe as when I first got injured], the evaluating Medical Examiner told me to get out of Nursing. "Lord, I don't want to get out of Nursing because in my heart, that's what I want to do. I want to help out others. I am suffering with this neck pain Lord but I thank You anyway because this pain helps me remember that I need to depend on You, that I can't make it on my own...Please help me Lord. You're the only One Who can help me and I don't know the next road to take..."
[As I was crying, for some reason I typed on the keyboard and spelled "correctional". From a long list, the one on top caught my eye. They were hiring in this particular facility ASAP. "Is it Your answer O Lord? I asked Him.." To make it short, I got hired even before I was pulling into our garage on the day of my interview. [I had only waited for 2 weeks instead of the usual 2-3 months background check]. That was 9 years ago. The Lord had brought me to another setting where He could truly use me as His instrument in sharing the Good News. And through this blog, I praise You Oh Lord! I want them to know how You are always there, giving us strength when we are weak, reaching out to us when we fall, straightening out any confusions in our life's journey, and hugging us when we feel so alone and battered by this life's troubles. Thank You Oh Lord for Your love, Your mercy, Your gift of salvation. 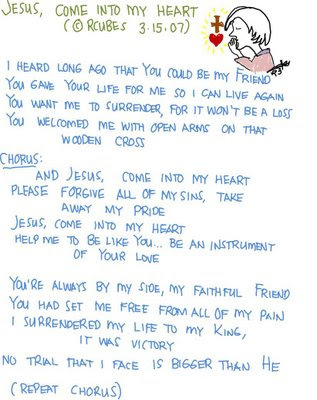 I surrender everything to You Lord. May my life be a sweet offering to You. I love You Lord. Psalm 33:11- "But the plans of the LORD stand firm forever, the purposes of his heart through all generations." Proverbs 16:1 -" To man belong the plans of the heart, but from the LORD comes the reply of the tongue." Proverbs 16:3 - "Commit to the LORD whatever you do, and your plans will succeed." Proverbs 16:9 - "In his heart a man plans his course, but the LORD determines his steps." 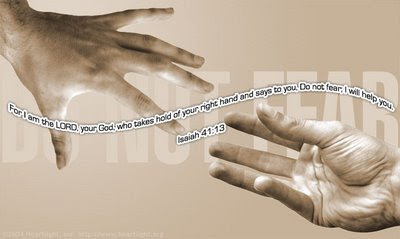 Isaiah 41:13 - "For I am the LORD, your God, who takes hold of your right hand and says to you, Do not fear; I will help you." The wrist cuff started puffing up on its own and restricted the circulation around my left wrist. The numbers digitally shown started going down slowly...The reading ended at "133/81." That reading wasn't bad at all if you are like me who have a history of high blood pressure. That's even great because I haven't taken my morning pill yet that will help lower it down. This is an everyday habit that I need to do if I want to be responsibly able to control my blood pressure. Through that, it will continue to encourage me to eat healthier foods and exercise, even if my will is trying to resist to follow those sometimes. It will help me remember to avoid fatty foods, stuff that will just clog the arteries more and will end up causing a higher blood pressure. Temptations are around us as we are surrounded with "fast-food chains", "jumbo sizes of meals", tv shows and video games that will keep you sitting on the couch for hours. please be the blood pressure monitor in my life. Please check and remind me by giving me Your daily reading. Show me if there's any pride or high reading in my heart. Please help me remember to avoid any of the impurities and temptations surrounding me. Help me to remember that I no longer live but You are in me. Remind me, Oh Lord that all of my unstable ways I can surrender to You so that You will give me a recorded reading of a life living for You.